I try to draft a post as soon as I have made something so I don’t forget what I’ve done. However, for one reason or another I don’t always publish immediately and some drafts get forgotten about. This is one such that I have just discovered from nearly two years ago. Sadly, the photographs are not up to much and I can no longer remember whose recipe I used as a guide. But I do remember they tasted good, so these blueberry muffins are finally getting an airing. Having just picked up some cut price blueberries I thought I’d better hotfoot it back to the kitchen and make some blueberry muffins. Can you believe it? I’ve never made blueberry muffins before. This seemed a prime opportunity to use the flowery blue muffin cases that a friend gave me for my birthday, still lying homeless in my kitchen. Melted 50g unsalted butter in a pan. Sifted 150g flour (50g spelt, 75g white, 25g coconut), 1/2 tsp baking powder, a pinch of salt and 1/8 tsp cinnamon into a bowl. Stirred in 75g cardamom (golden caster) sugar. Mixed 50ml creme fraiche, 50ml milk and 1 egg until all smooth. Made a well in the centre of the dry ingredients and poured in the egg mixture. Tried to mix this, but oh dear, it was way too dry! Added the butter hoping that would sort it out, but still to dry. Added some more creme fraiche and milk (nearly the same again) until I had a consistency I was sort of satisfied with. Roughly stirred in 50g 40% milk chocolate drops. Roughly stirred in 100g washed blueberries. Spooned the mixture into 6 muffin cases initially, but realised I had too much mixture, so added a couple of extra. Well eight muffins has got to be better than six. This gave me license to munch my way through the two extra ones whilst they were still warm – mmmmm – a very nice way to eat them. In my gluttonous haste I managed to burn my tongue with the first bite into the hot blueberry juice. I doubt I’ll learn the lesson though. The blueberries had burst and were all fruity and jammy with juice running everywhere. These were not very sweet and had more of a scone consistency than a muffin one. However, the coconut flavour was nicely evident and the tart fruit and semi-sweet chocolate was a very nice combination. 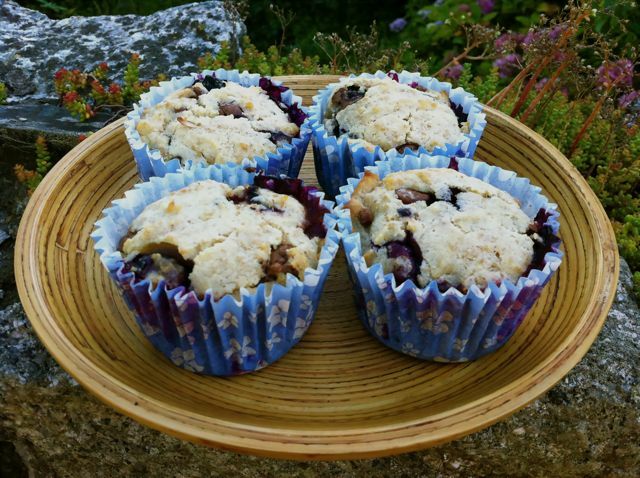 These muffins fit very nicely into a new challenge newly created by Victoria of A Kick at the Pantry Door. Feel Good Food is all about delicious but healthy food and this month it’s all about blueberries. I’m also linking this to Four Seasons Food as blueberries are in and it’s meant to be summer – with Delicieux and Chez Foti. Haha – I do that too! I’m glad you grabbed this from the archives – chocolate and blueberry is such a classic combo. Just wanted to say many congrats on being so successful on Foodies100, you are reaching heady heights! I have made muffins myself today too, banoffee but always love a good classic blueberry which can only improve with te addition of chocolate! Can I say, I would like to have a blueberry muffin now? It sounds very tasty! Thanks for entering these to Feel Good Food Choclette! They look and sound delicious, and 8 is always better than 6! The spelt and coconut flour sounds like a fabulous idea too.